I decided to do something special for Addison’s Christmas present this year (along with the rest of the toys). 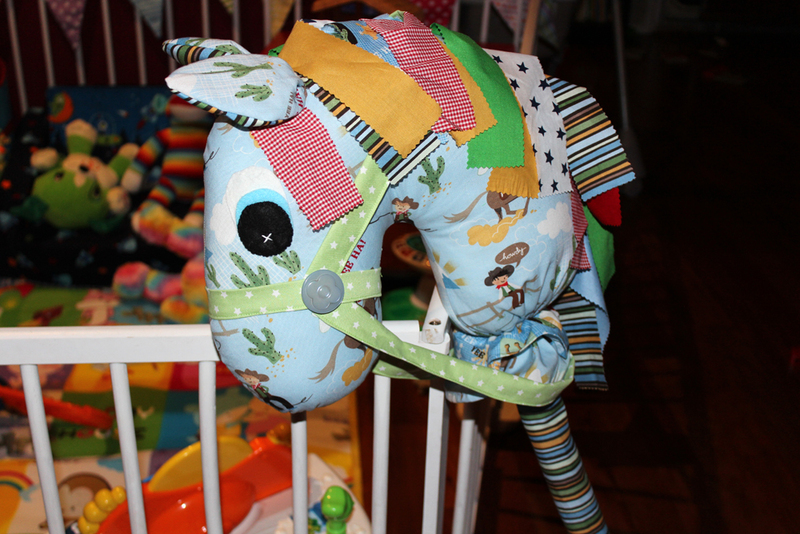 I had seen handmade hobby horses on a Facebook page not too long ago and loved them. Unfortunately the price tag was a little more than I would want to pay, and thought I would give it a go making one myself. I actually already had some cowboy fabric that I wanted to use for the horse (I’d previously bought it to make some shorts with, but never got the time). The hardest part of making the pattern for the hobby horse was working with the fabric I already had. I couldn’t get the fabric anymore so I had to work with the amount of material I already had. I used some other matching fabric to extend the bottom a little bit further, but apart from that, I had the perfect amount to make the hobby horse. It was actually really simple to make, and I’m so happy with the results. I made him a harness with some coordinating fabric. Found a couple giant buttons for it too. The stick is actually a curtain rod that I’ve covered with wadding and fabric, which made it nice and padded. I hope Addi likes his special, handmade Christmas gift. Hi Melissa, nothing beats a homemade gift – it will be a treasure long after the plastic fades and cracks! You are very clever – this would be good for your pattern file.